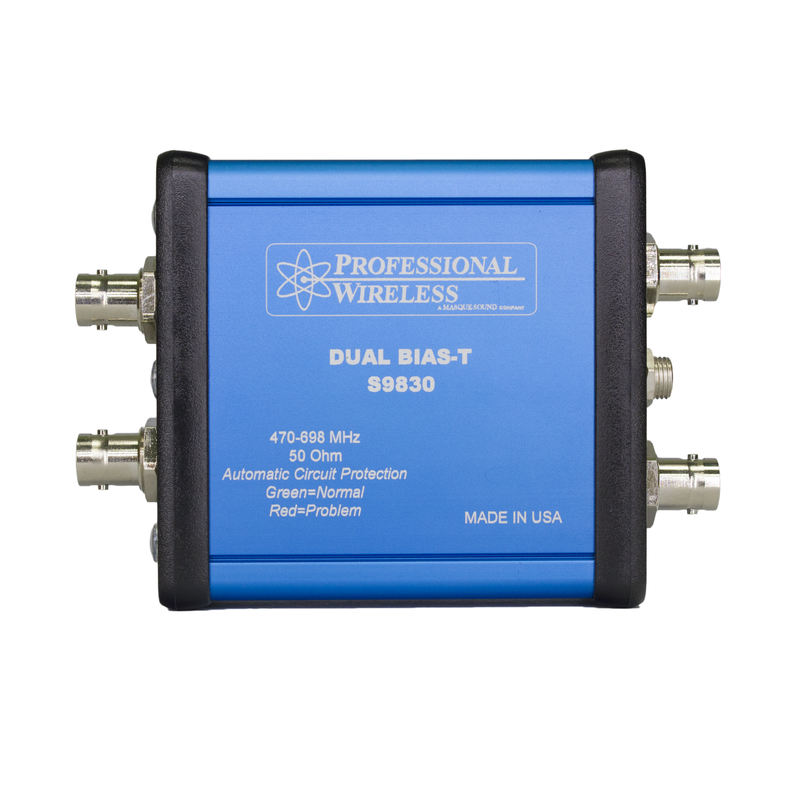 The Dual Bias-T provides phantom style voltage to remote antenna amplifiers via two independent channels. The Dual Bias-T provides phantom style voltage of +12VDC to remote antenna amplifiers via two independent channels. Each side of the Dual Bias Tee includes independent short circuit protection and indicators. Current draw in excess of 80mA per channel will cause the short circuit protection to remove power from that channel while power to the other channel remains unaffected. The Dual Bias Tee works with the PWS remote line amp as well as some Sennheiser and Shure remote amplifiers that receive 12V DC power via the center conductor of a coaxial cable and with a current draw between 35 and 80mA. Insertion loss from 450 to 750 MHz is less than or equal to -0.25dB and isolation between channels is greater than 50dB. The included power supply is a single plug space US switching power supply rated at 0.8A, Input is 100-120 VAC, 50/60 Hz. The antenna connections are BNC(f) and indicators light when power is being supplied up each cable.